Io is the innermost of the four Galilean moons of Jupiter and, with a diameter of 3,642 kilometers, the fourth-largest moon in the Solar System. It has a young surface with no obvious impact craters. It has no water to speak of and no magnetic field. With over 400 active volcanoes, Io is the most geologically active object in the Solar System. This extreme geologic activity is the result of tidal heating from friction generated within Io’s interior as it is pulled between Jupiter and the other Galilean satellites—Europa, Ganymede and Callisto. Several volcanoes produce plumes of sulfur and sulfur dioxide (SO2) that climb as high as 500 km above the surface. Io’s volcanoes, distributed all over its surface, are the only known active magma volcanoes in the solar system other than those on Earth. A global magma ocean lying beneath about 30 to 50 km of Io’s crust helps explain the moon’s activity. Recent analysis of data reveals a subsurface ocean of molten or partially molten magma beneath the surface. Numerous extensive lava flows, several more than 500 km in length, also mark the surface. The materials produced by this volcanism provide material for Io’s extremely thin, patchy atmosphere. Io’s volcanic ejecta also produce a large doughnut-shaped cloud of intense radiation referred to as a plasma torus. Ions escaping from this torus inflate Jupiter’s magnetosphere to over twice the size we would expect. Io’s surface is dotted with, besides volcanoes and lava flows, more than 100 mountains. Some of these peaks are taller than Earth’s Mount Everest. 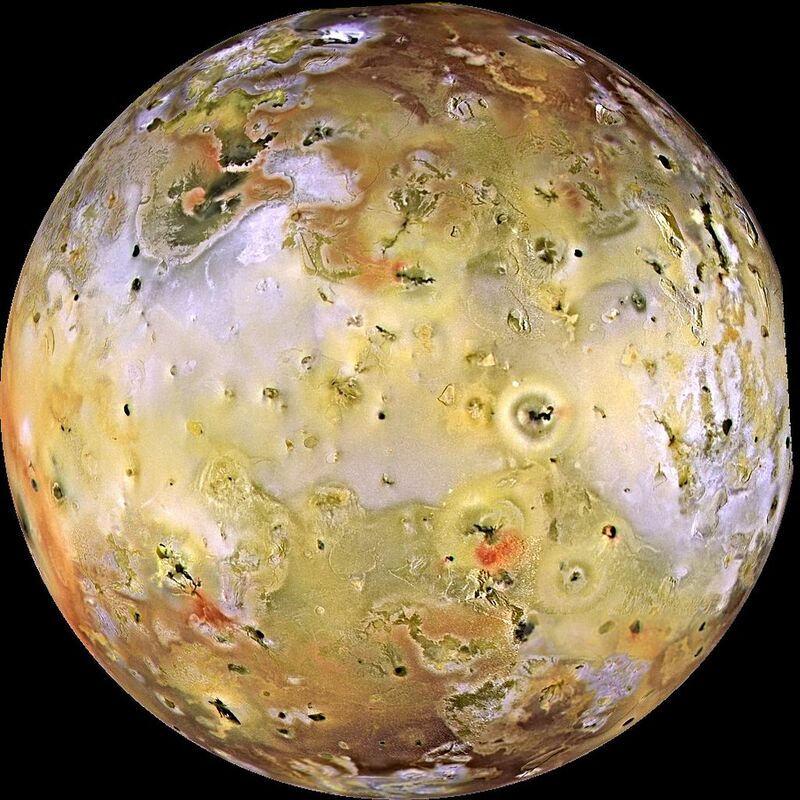 Unlike most satellites in the outer Solar System, which are mostly composed of water-ice, Io is primarily composed of silicate rock surrounding a molten iron or iron sulfide core. Most of Io’s surface is characterized by extensive plains coated with sulfur and sulfur dioxide frost.